NaNoWriMo or National Novel Writing month. Although we’re already 5 days into November, which means we’re grossly behind on the deadline to write 50 K words by the end of the month, Skip has already started by writing the first chapter in a mystery tale. It’s in the point of view of “first person,” which made me laugh out loud picturing him as a private detective pulling out his gun in a parking garage…and he wants us to alternate writing chapters. Maybe we can incorporate a character who knits and dabbles in the creative arts while dodging bullets, so I can write about what I know? Postings of what my Facebook friends are thankful for leading up to Thanksgiving: Thirty Days of Thankfulness. 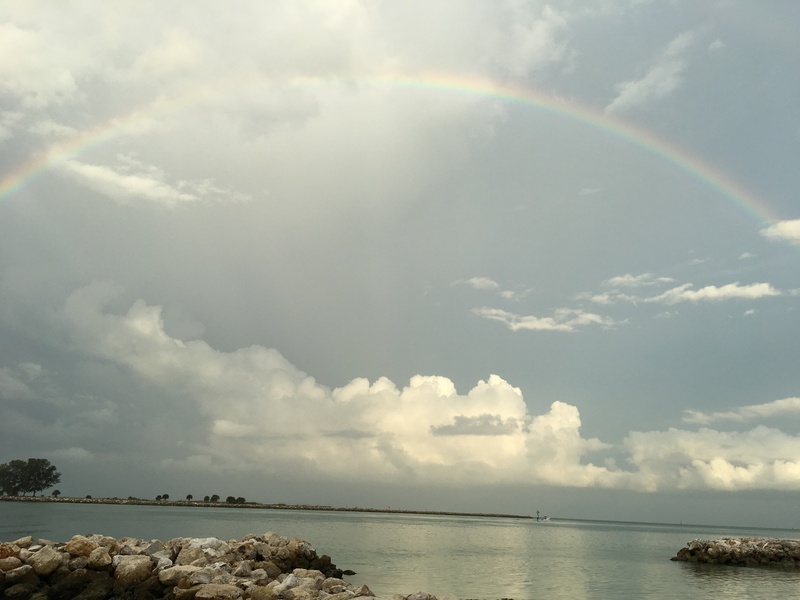 I always enjoy this, because it helps to count one’s blessings, and having visual images of them is a plus. 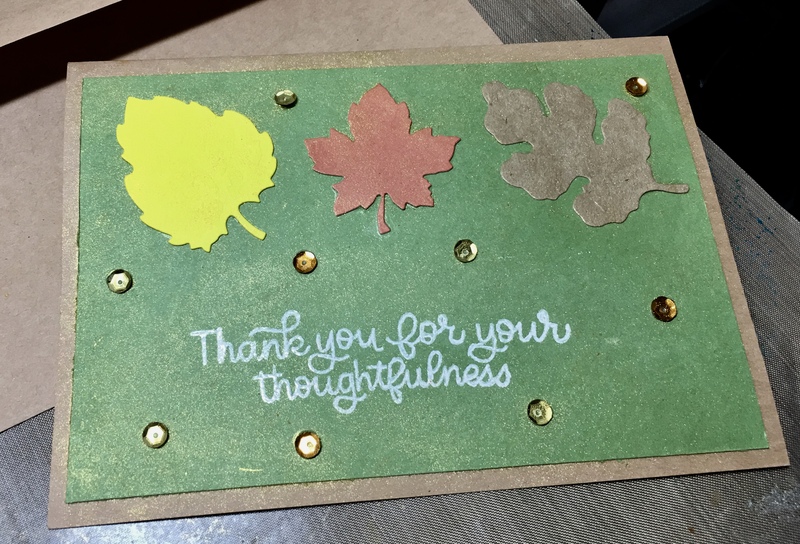 I’m going to alter that concept slightly by making a “Thank You” card every day of the month. I’ve already made a couple, so as not to get too far behind on this deadline. 3. November is the time of year that men stop shaving for some reason. A carryover from caveman times, to add insulation against the cold weather? We’ve got Movember, which puts emphasis on mustaches, and/or No Shave November, in which guys don’t shave at all. If you want some clarification on this, here’s a link to a comprehensive blog post about it. Personally, I’m like Olive Oyl and I like a Clean Shaven Man, but it is somewhat interesting to see the beards and mustaches sallying forth among all the other activities this month! Ponyboy demonstrates a couple of things that can be done with those empty boxes from the subscription to monthly card-making kits. 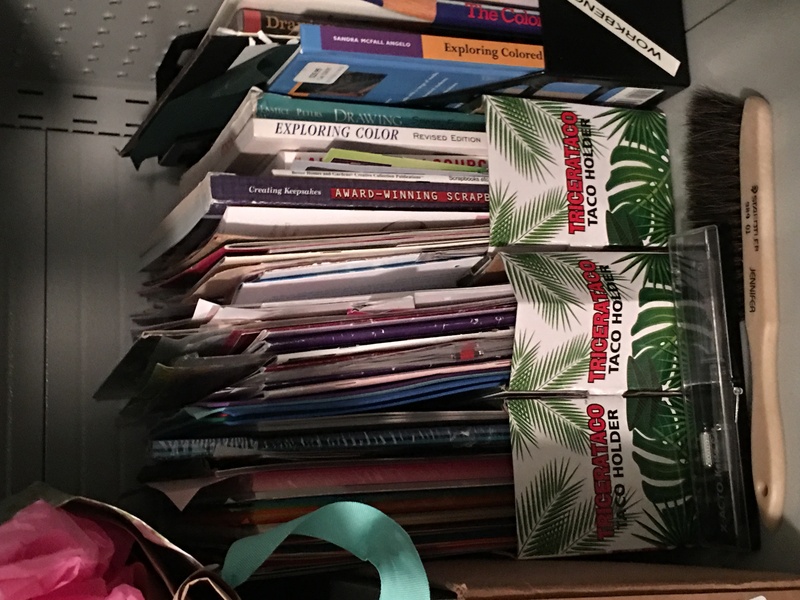 One: I labeled them on the side and used them to store cards in the craft cabinet. Two: He can cram his overfed bohunkus into one and lie down for a nap. 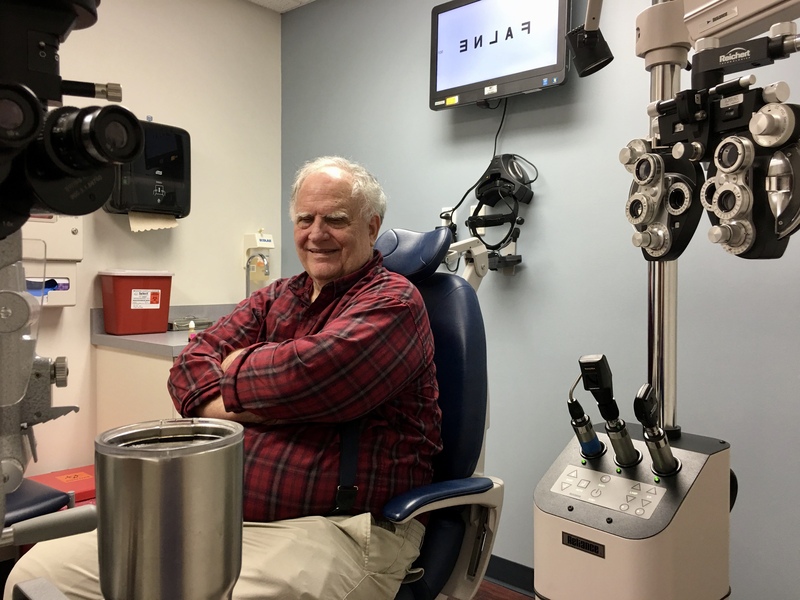 Skip, feeling better about most things visual, is looking for some new projects. 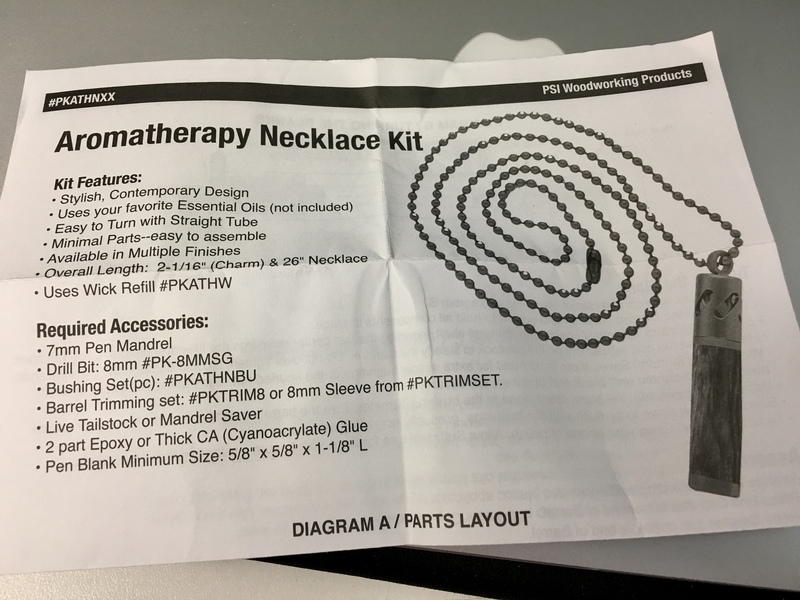 What with the popularity of essential oils, he found a great kit at one of his favorite online locations, Penn State Industries, for Aromatherapy Necklaces that hold a few drops of essential oils within little vials that can be turned on the lathe. Here is one he made for me, out of “genuine olive wood from Jerusalem”! 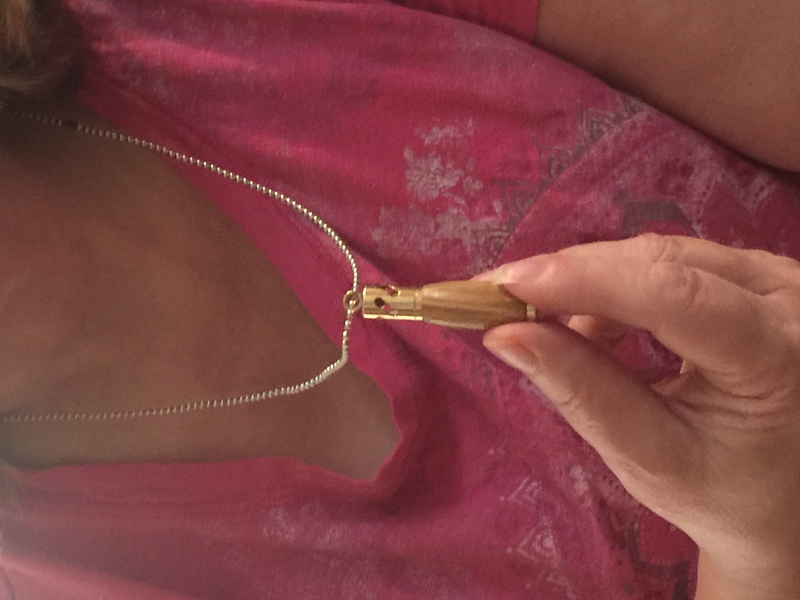 It is beautiful, and he said it took him about 5 minutes to turn on the lathe! The kit comes with several wicks, so you can change up the variety of essential oil whose vapors you want to go around sniffing all day. Since I feel a little cold coming on (what would the change of season be without one, right?) I put some drops of an oil called “Breathe” in the vial. 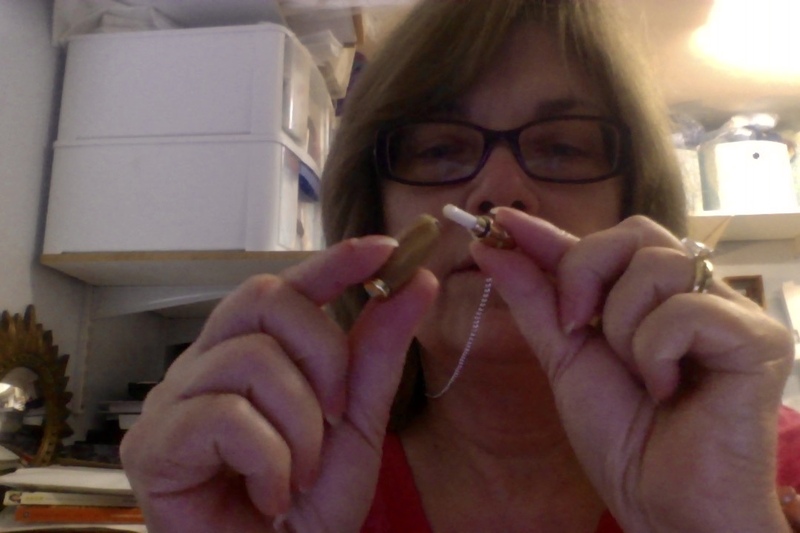 The gold coupling that is attached to the vial, and can be threaded onto the neck chain, has little stylized openings, to let the vapors waft through from the wick. 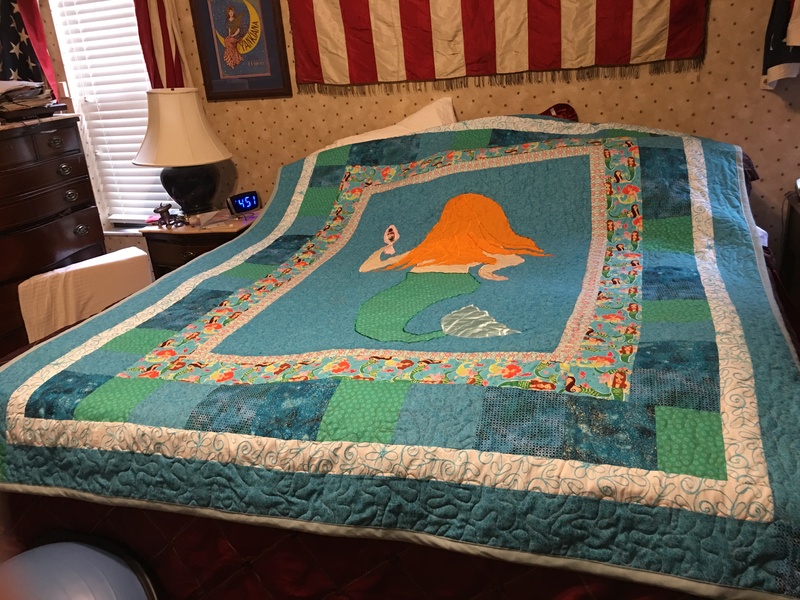 What an awesome project; I definitely feel better already! I’m slowly coming back from a 10-day fast from Social Media. Some of my friends have done the same, making the 10-day fast not just a pity party of one, but really quite a social experiment. Some of the results of this time period are eye-opening! Of course, I had more time on my hands that I felt obligated to fill, doing something else. Being a crafter, you’d think I’d have had lots more time to make crafts. However, I cut back on watching You-tube videos of craft techniques because—You-tube is a form of social media. So my idea stream dried up a little. Some of the activities that were suggested to do, rather than stare into the social media screen, included reading, exercising, cooking, communicating with real friends rather than virtual ones, hobbies, and cleaning. 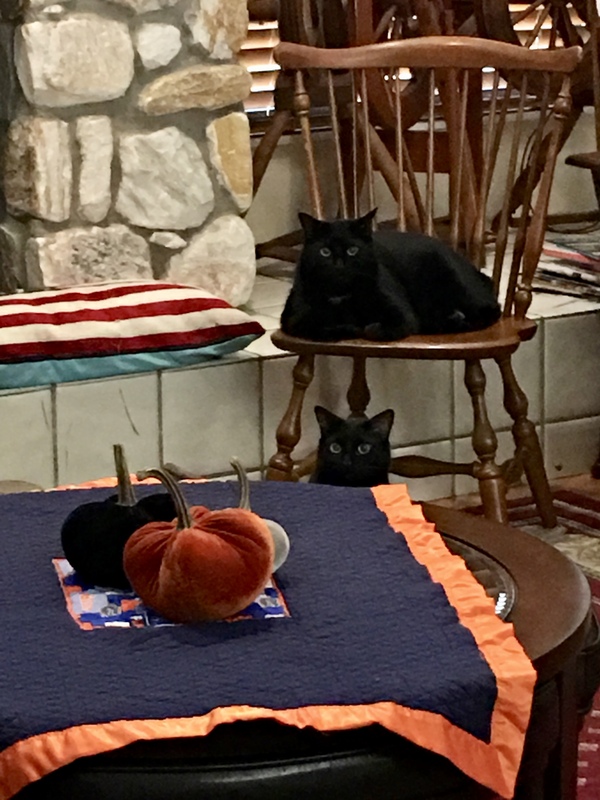 Here’s another idea: decorating with LIVE Halloween decorations! I downloaded a couple of new Kindle books and read them, but hey! I was still in the habitual posture of staring at a little screen. Reading a novel is different than reading the little sound-bites and meme captions that you work through for hours a day on Facebook and its cronies Instagram and Twitter. Is a novel, then, better? Am I a better person for sailing on a ship in an ocean of complex constructed plot lines with character development, rather than splashing in the puddles of meme expressions and punchlines? 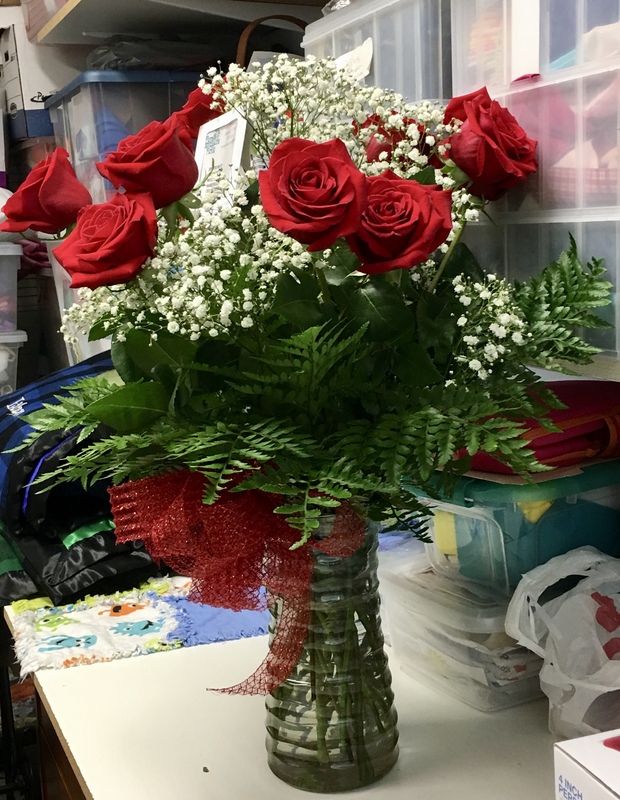 Skip is pretty good with sending beautiful flowers and spreading around a lot of happiness that way. 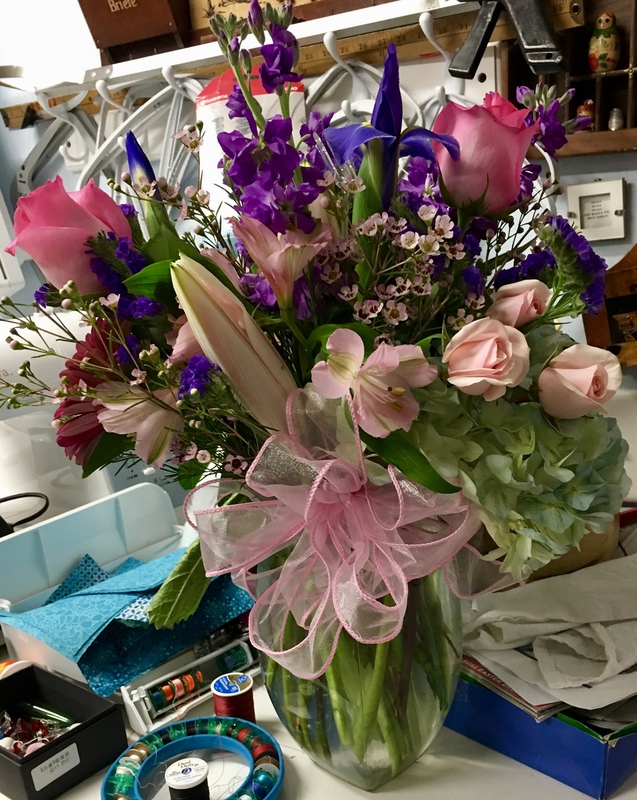 But I couldn’t help wondering if posting the pics is…gulp…humble-bragging? Ugh, Social Media will catch you up in that. 3. Some of my “friends” posted that they were shocked when they realized how much time they spent on those chummy social sites, and they’re going to set a timer in the future. And what a coincidence, a new iOS came out during the 10-day fast, which now actually logs the amount of time I spend on the phone or tablet. It divides the time into these categories: Social Networking, Productivity, and Creativity. I can schedule time to stay away and set limits and restrict myself from certain things. I could probably find a way to fool it into recording something unproductive as productive, but what if it finds out I’m trying to buck the system? I don’t want to be made into an unfavorable example when the Singularity comes around. 4. 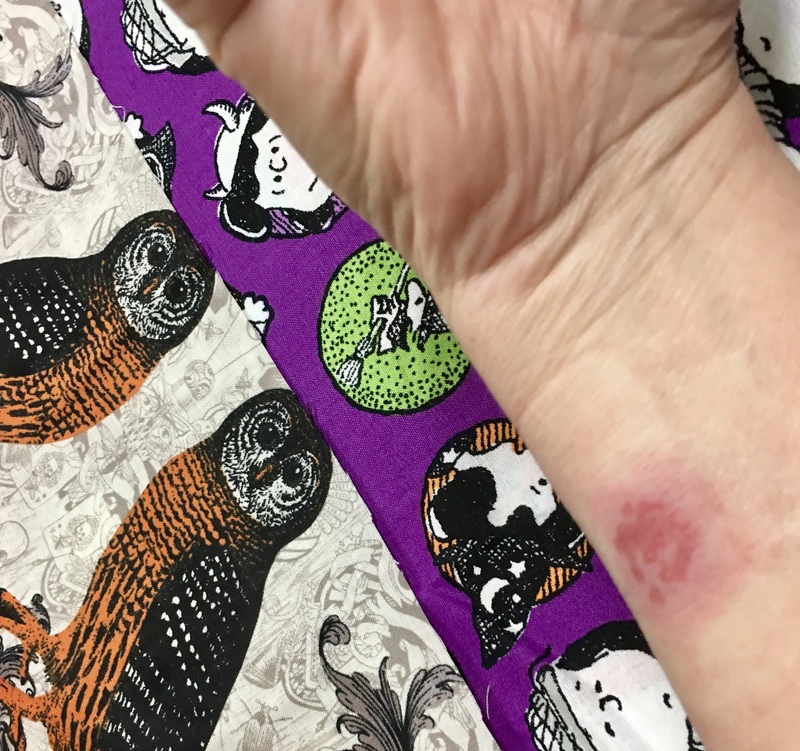 I’m more aware of my humanness, since I also sustained a physical injury (spider bite?) during the social media fast, probably when I was gardening. That goes to show what happens when you leave the virtual world and try to participate in real-time activities! The first couple of days I had some serious aches and pains in my right armpit and felt like I was running a fever, but I wasn’t. It felt like a hard, tough miniature heat-infused hockey puck was underneath the bite. As you can see, it’s right at the area my arm would rest on the desk while typing. I kept bumping it on everything. I finally found these colloidal band-aids to keep it covered up, and the swelling underneath gradually went away, after many days. Perhaps staying off social media sites for 10 days won’t break any long-held habits, but it did give me a long, slow breathing space to ponder the time I’ve actually spent, engrossed in some things I don’t really want to care about! 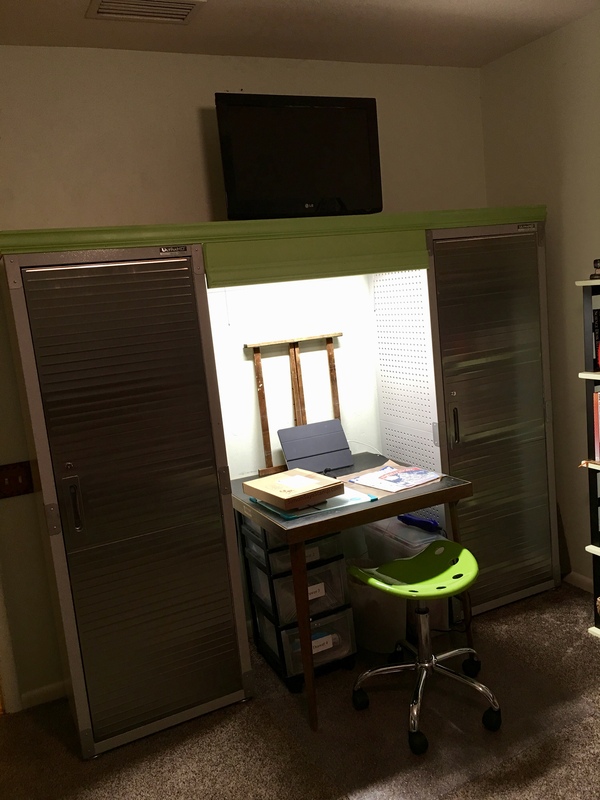 Continuing from where we left off in the previous post, we did some more work on the Craft Room Re-do. 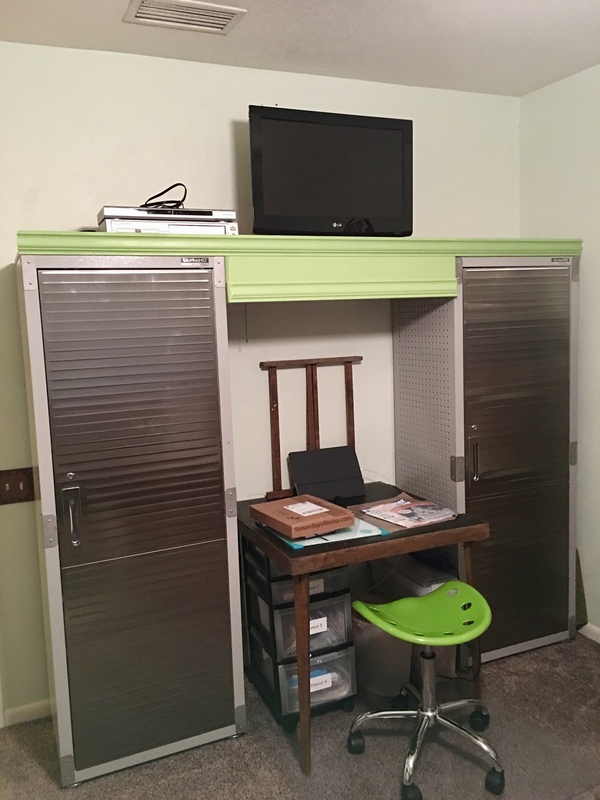 We added a piece of plywood across the top of the two cabinets, which we planned for the TV and VCR/DVD player to sit on, and nailed up some primed, sanded and painted molding to cover the raw edges. 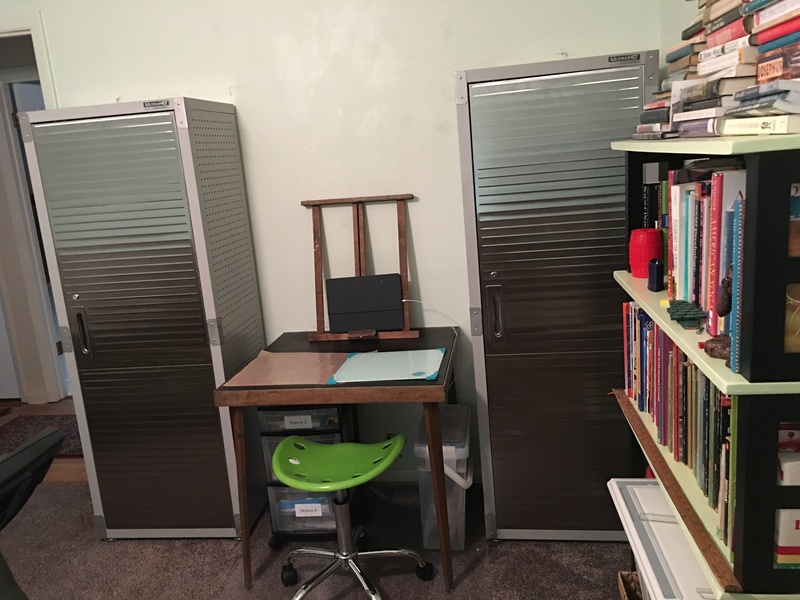 Skip put together a brace made of some strips of plywood, nailed it to the back of the plywood shelf, and fastened the structure to the wall stud. It looks very utilitarian–and it is! The cabinets are roomy and can be closed and locked, making all those sharp blades, tiny objects, and fume-y chemicals out of the reach of curious grandkids! And everything on, under, and including the table can be moved somewhere else. 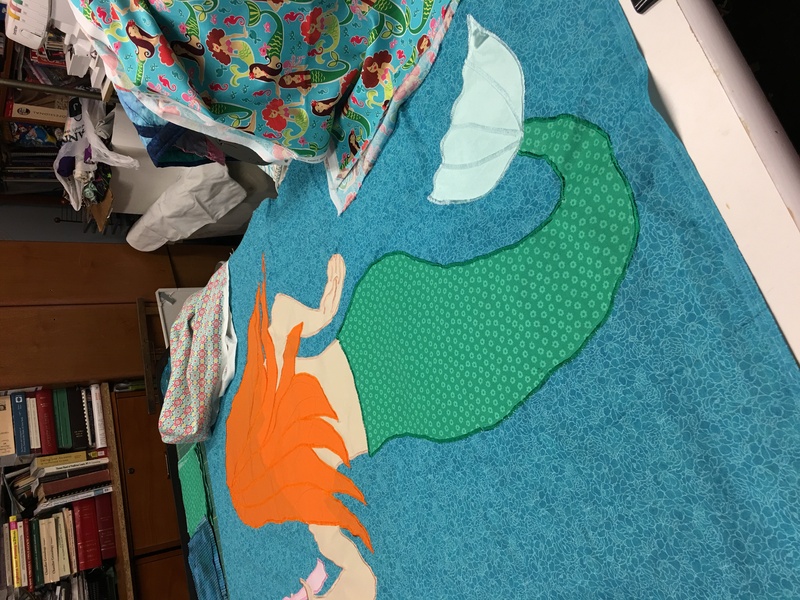 Now… let’s get to crafting…. I threw out a lot of it, temporarily keeping a few categories of things: doll stuff, doll house stuff, toys with wheels, blocks, animals both current and extinct, potato-head stuff, mag-formers, art supplies, and books. 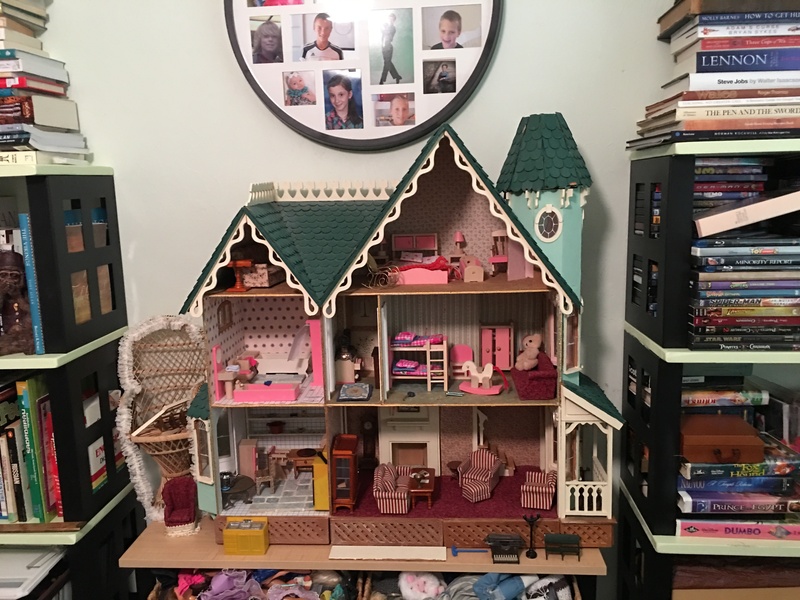 My poor mom would be scandalized at the condition of the doll house she worked countless hours fitting up. 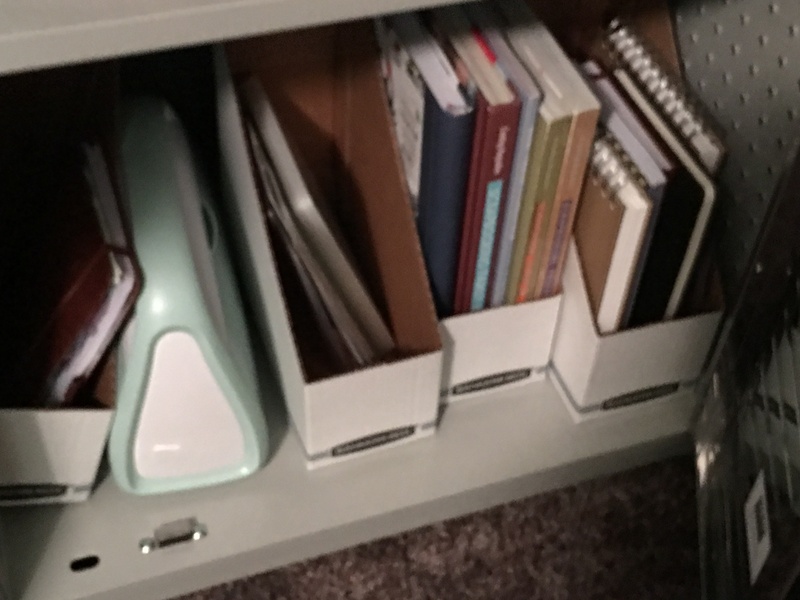 I actually have a big box in the top shelf of the closet FULL of broken doll house furniture, which I replaced with cheap wooden and plastic items that I hoped would be more kid-friendly, but even those haven’t proven indestructible. I didn’t take a “before” picture, but we moved a huge old Sauder entertainment center out of here piece by piece. It didn’t look too terrible, but it was big and overwhelming, and had digs in the fake-mahogany finish. 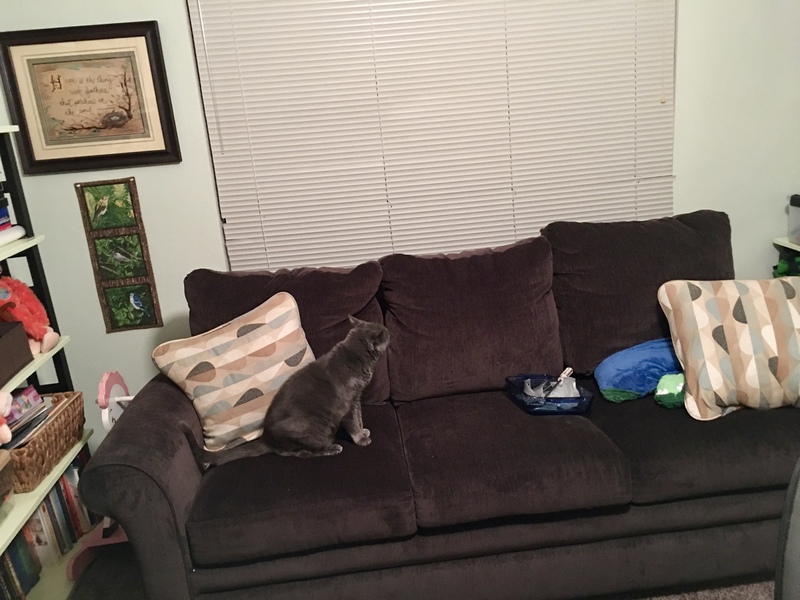 We had a massive old TV set sitting on the big center shelf, and a VHS/DVD player perched up on the top shelf. The work desk in between the cabinets is a very old card table we had stashed away in the living room. 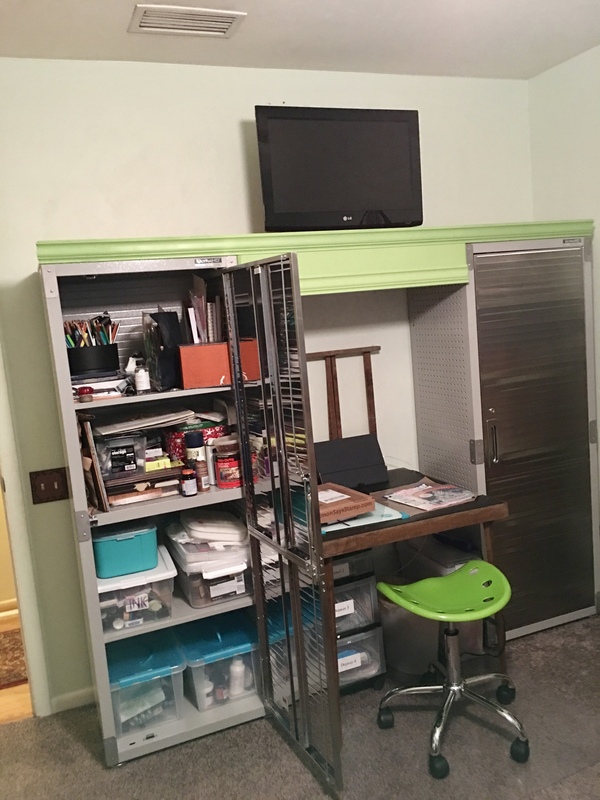 It’s already the right height and size for a craft desk, plus it’s moveable. Score! The next step will be to install a long shelf above the cabinets, which will support the VHS/DVD player and a newer flat-screen TV that we got free 🙂 , from shopping in another room of the house. We’re going to install some lighting under the shelf and edge the shelf with some molding. Then, with lighting installed, let the crafting begin! Welcome to that time of year when we live in suspended activity for just a few days/weeks before the academic year kicks into high gear. 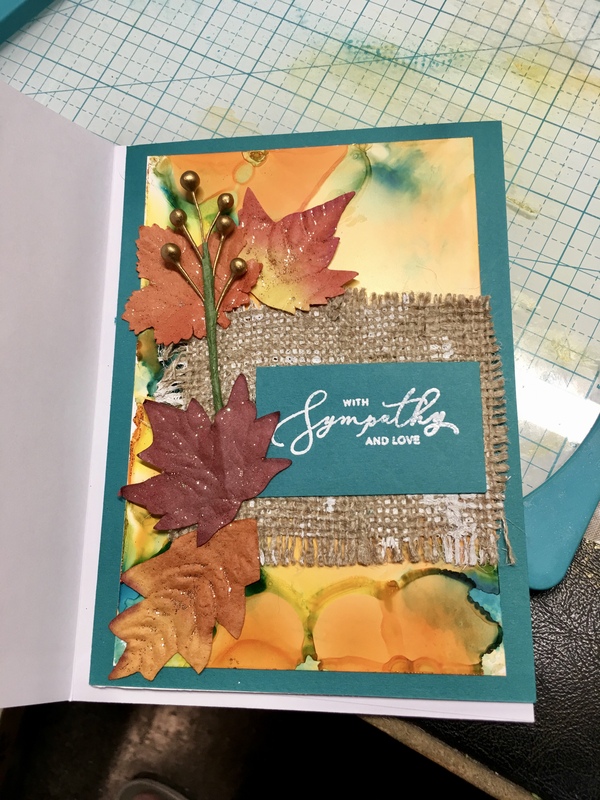 Still doing cards, and becoming more acquainted with the burgeoning world of card crafters on Youtube and the blogisphere. A few of us in the Wednesday Night Knitting Group are making cards and papercrafts. 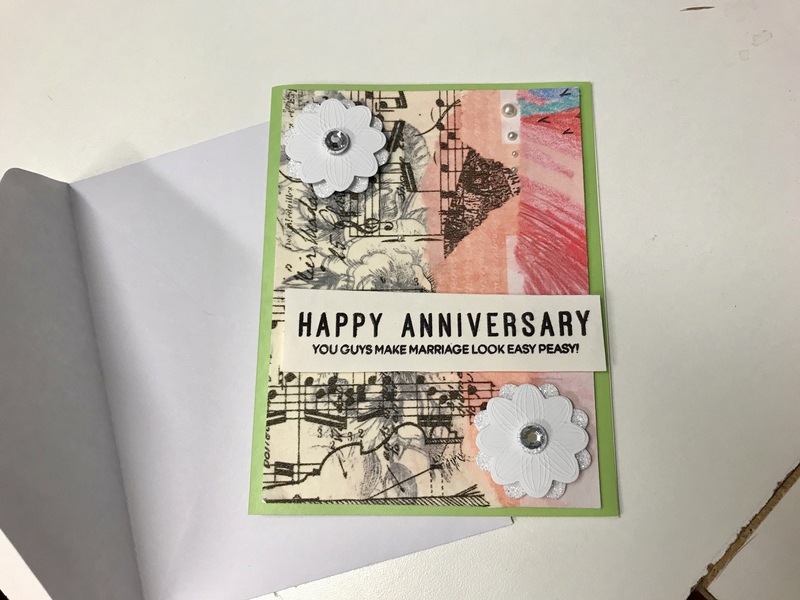 And even Skip is getting in on it, providing “sentiments” (as the text components of greeting cards are called) of a funny and sometimes better-left-unsaid nature; e.g. “Tanks for all you do” or “I’m flushed with happiness”–with a picture of a toilet, and others…. 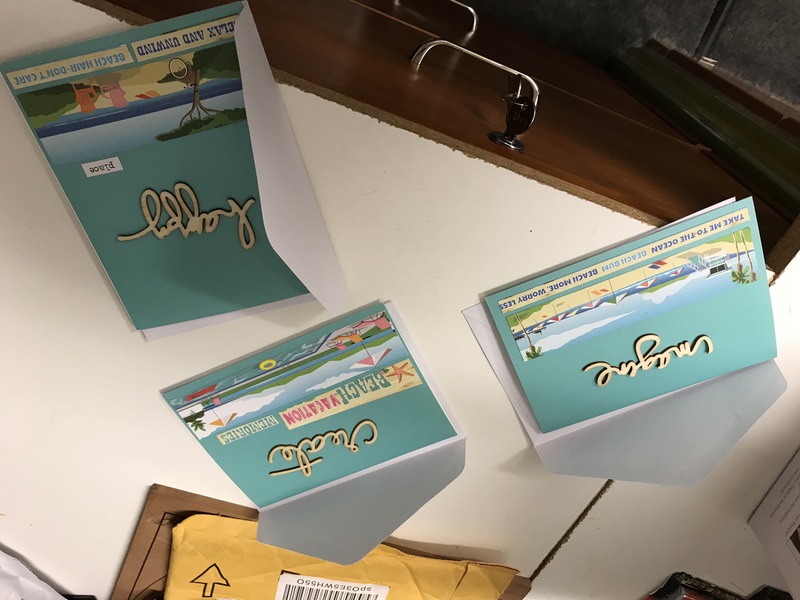 Then I made a few quick, easy beach cards using some Heidi Swapp laser-cut basswood lettering that was in little packages on the clearance rack at Joann’s, but we have already been experimenting with laser-cutting our own letters and motifs, too. It’s a whole new world of little bitty things to make! 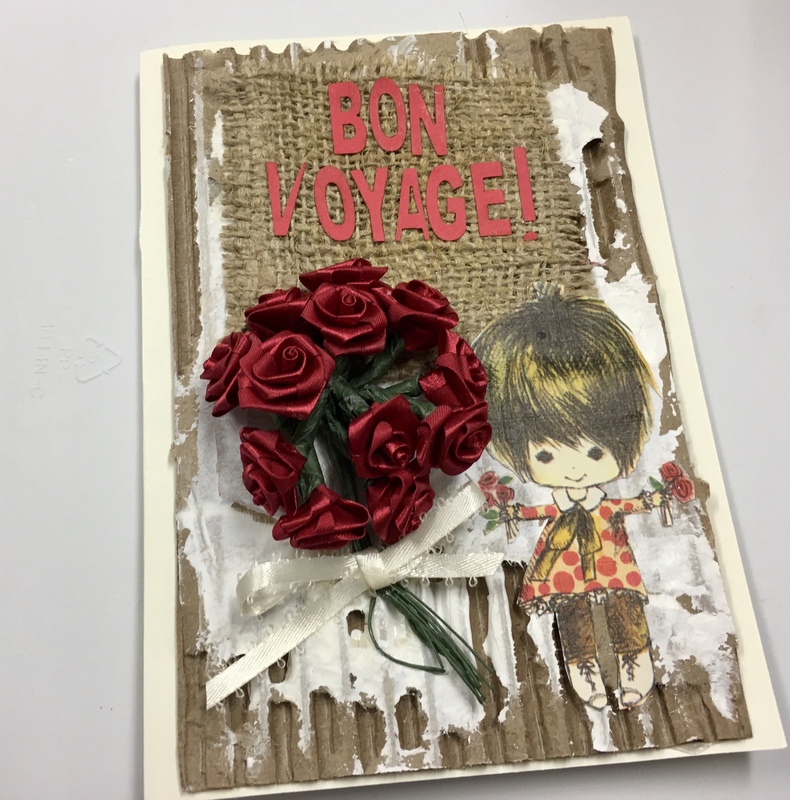 The pattern paper beach scenes are cut-outs from the Simon Says Stamp July kit. 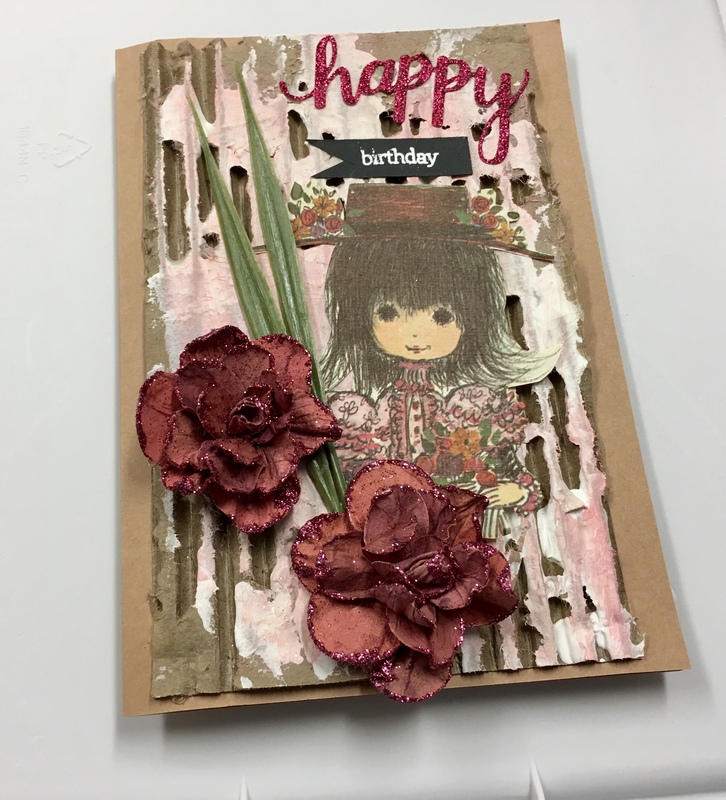 The focus here is the corrugated cardboard background, which is derived from a box that was in the recycle bin, embellished with other 3D elements, which may or may not also be from the trash. This girl image and the ones below, were little cut-outs I found in a box of my mom’s stuff. I don’t know why she cut out these images and saved them, and I don’t know what she cut them out of in the first place. 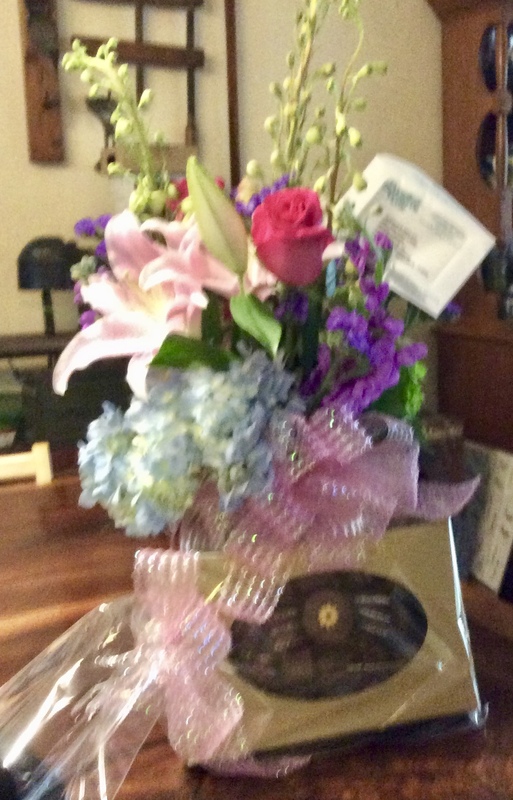 Would you believe this bulky card, with its oversized bouquet, does fit into its envelope, although a tight squeeze. ANW/Crestwood made in the USA value pack blank cards and envelopes. Hope you’re having a great transition time before school, football, cooler weather, and the (yikes!) march toward the holidays. 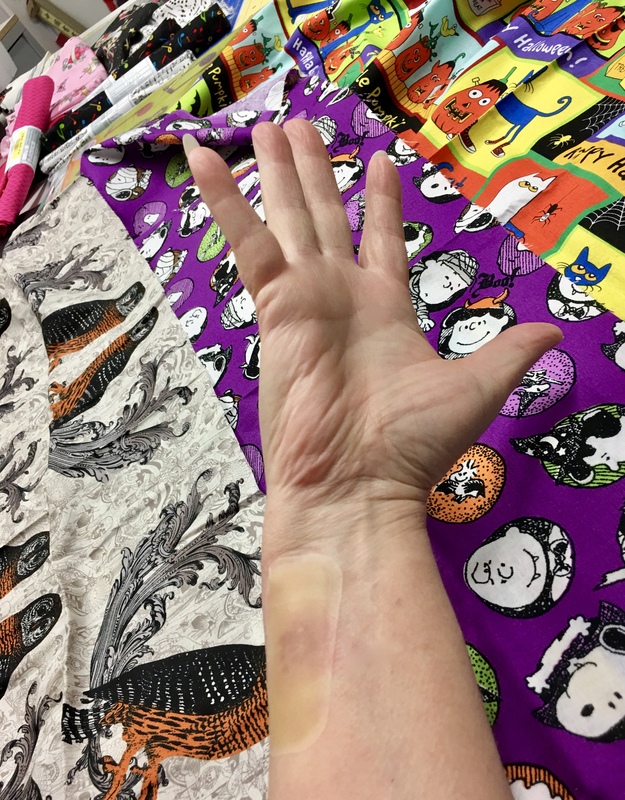 As a crafter/maker, you know that you must keep on producing…something, whether on a lathe, with hardware, the written word, paint, a sewing machine…something! Right? 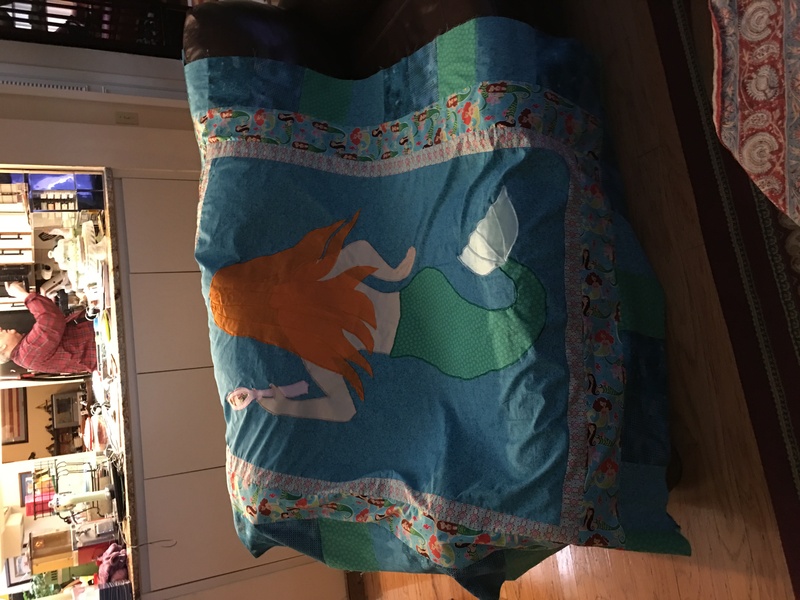 We’ve revived the Knitting group once a week, and expanded it to include other crafts as well. 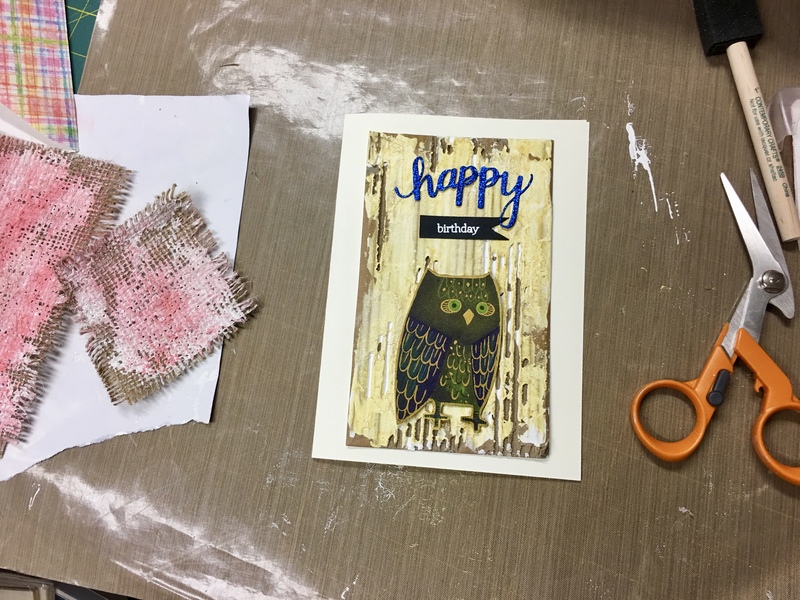 One focus that has come forth in the group is the making of greeting cards, mostly by Tricia and me. 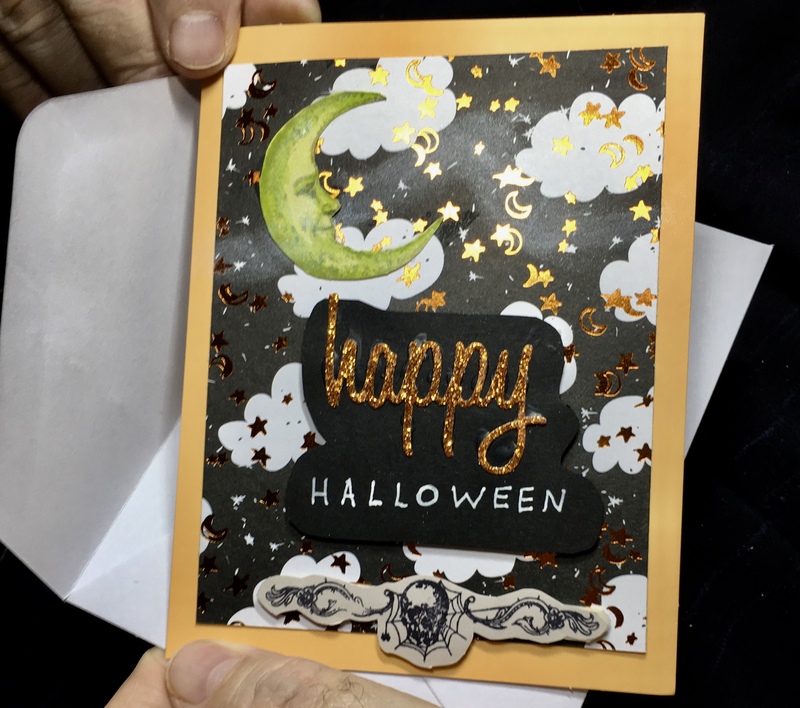 She went to a Papercrafting Expo and came back with some great ideas and a resolve to make all her own greeting cards. Papercrafting is BIG! The amount of tools and materials available for such pursuits is staggering. 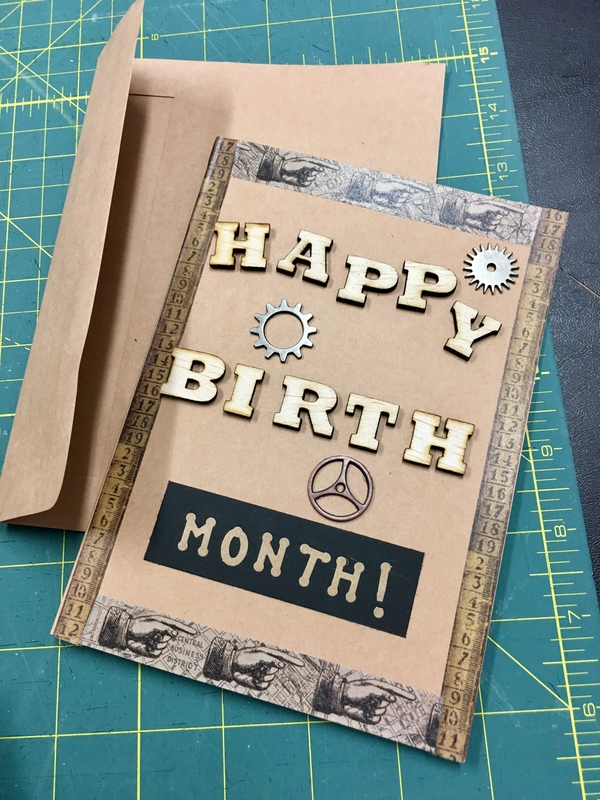 Several companies sell monthly kits with items that, they advertise, you can make at least 10 cards. With all the scraps and options you probably have around from previous projects, you can probably churn out way more than 10 from a kit (which costs about $40). 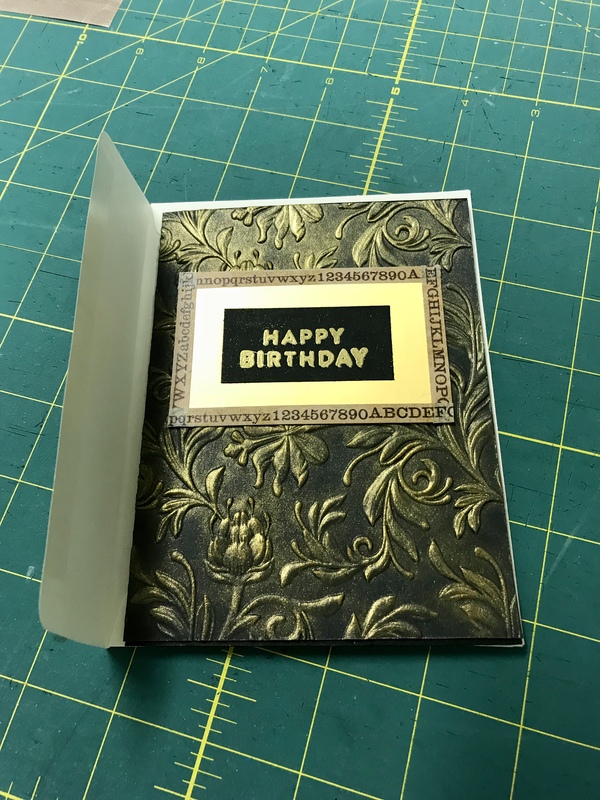 But when you go to the store to buy cards for an occasion, you’re going to probably spend $5 a piece, or more, if you can’t resist the really ornate ones. 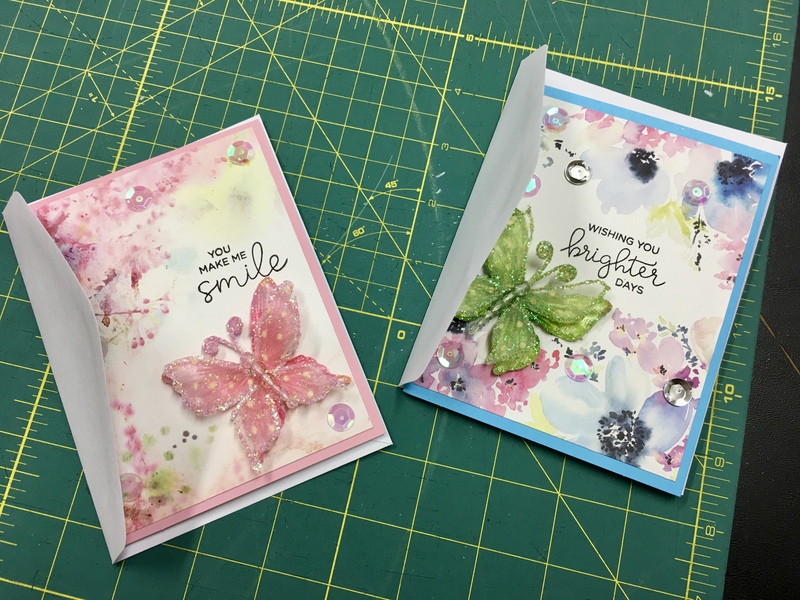 And several super You-tube makers vlog about the cards they made from the monthly kit, which can give you so much inspiration and ideas. 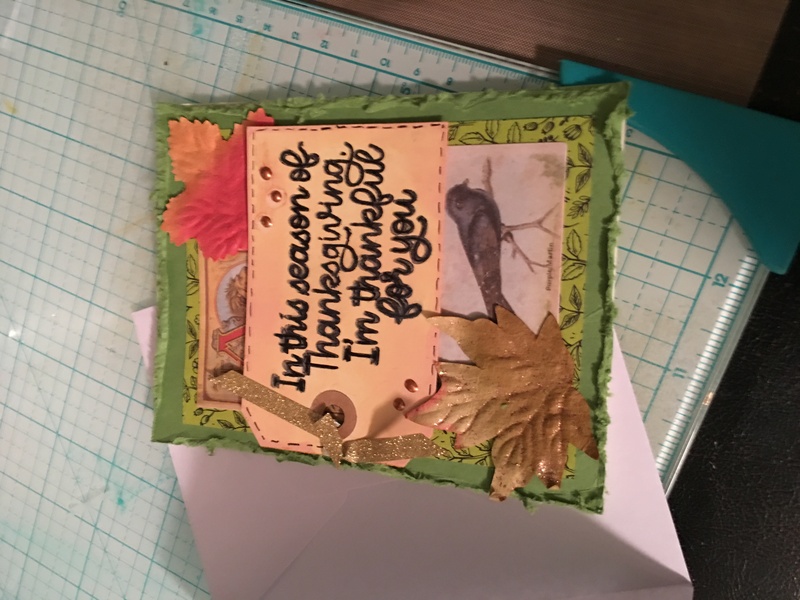 I learned how to use the leftover strips of card stock (hating to throw anything cute away) courtesy of Shari Carroll’s “Lovely Layered Cards from Top to Bottom” class on the Craftsy platform. These were made from 1) plain cards (the pink and blue “borders” in the photo above are the actual pink and blue cards that the decorative papers were glued onto) and envelopes that came in a big package of 80 sets from Michael’s on sale for $5, 2) two 6×6 pieces of card stock that came with the SSS kit, cut down to size so the background paper looks like a border, 3) the sentiments came from a couple of clear stamps and Archival jet black ink, 4) some large sequins I had leftover from my grandmother’s sewing stash, 5) floral butterflies from Hobby Lobby that came in a pkg of 4. The package of four floral butterflies and the package of 80 sets of cards and envelopes were each the same price; go figure! Remind Me Again Why We Mix Media? Don’t get me wrong, I adore that song, even if it is a little on the schmaltzy side. It clogged my mind with vague recollections of the feast that was the original movie with Humphrey Bogart and Lauren Bacall. The song, although cute and memorable, is not in the same league as the epic movie. Which brings me to my latest craft project, art journaling. 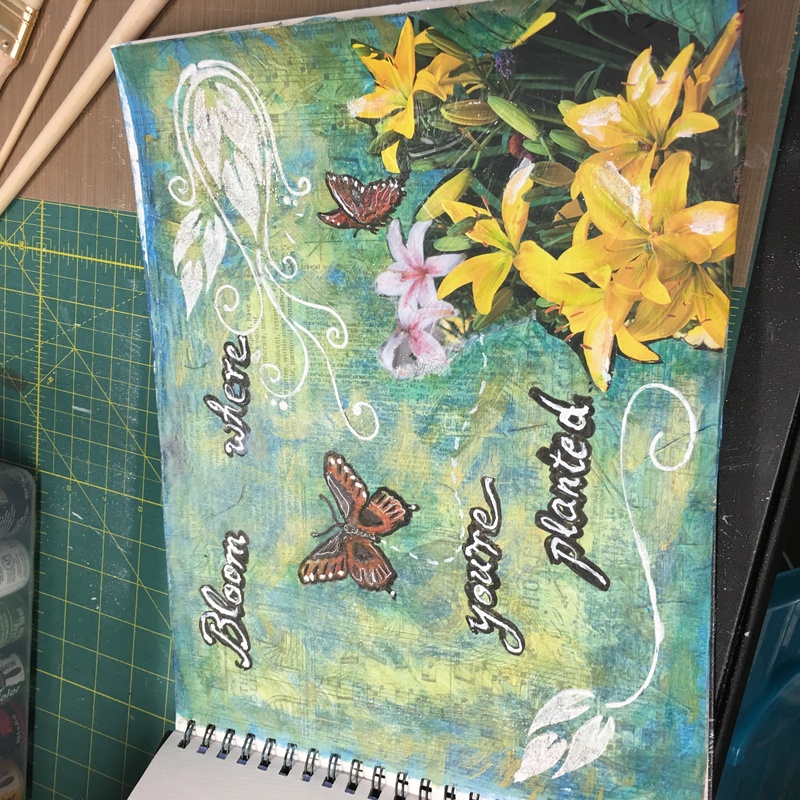 I was introduced to art journaling when I took an online class offered by University of Florida, called Healing With the Arts. It was fun, but I didn’t really accept it as a serious art form. Later I was surprised, astonished even, to discover that loads of people are out there art journaling, and there’s a giant craft market catering to those journalers! I would have never found this out if I hadn’t signed up for a free 2-week Craftsy subscription. 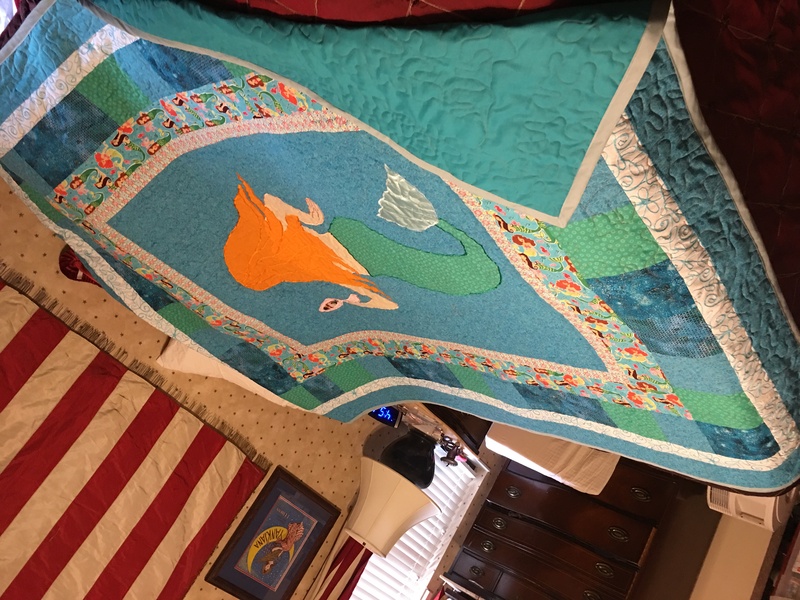 The old Craftsy had individual classes for sale, in many different categories, such as photography, sewing, woodworking, cooking, knitting, and various modes of visual art. They also offer kits and supplies to make some projects, and space to showcase your projects and interact with the community. 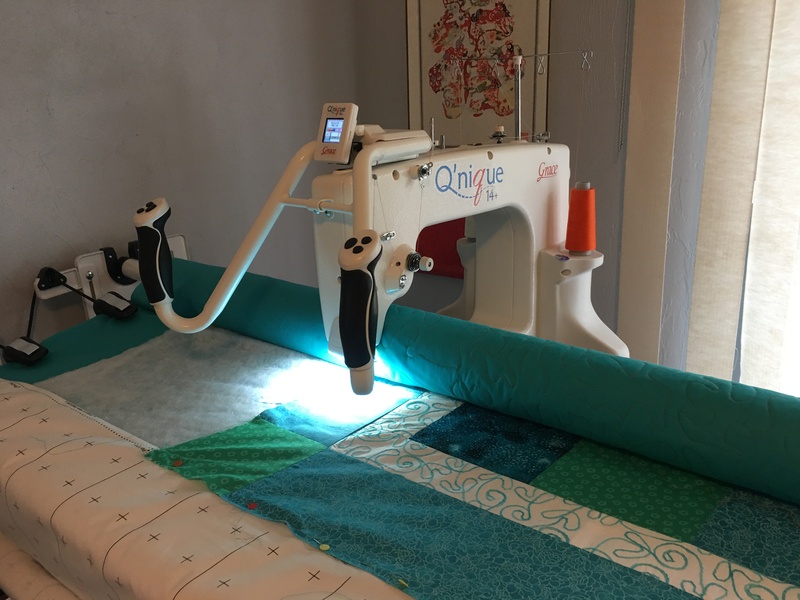 The recently updated Craftsy Unlimited has a monthly or yearly subscription fee, for which you can access ALL the content (with a few exceptions.) And from time to time, they add in a few perqs as incentives to subscribe, such as coupons to buy some of their merchandise. I did subscribe in between two awesome perq campaigns, and got none (so much for my loyalty as a paying customer!) But I have been combing through the class offerings, which are treasure troves of techniques! 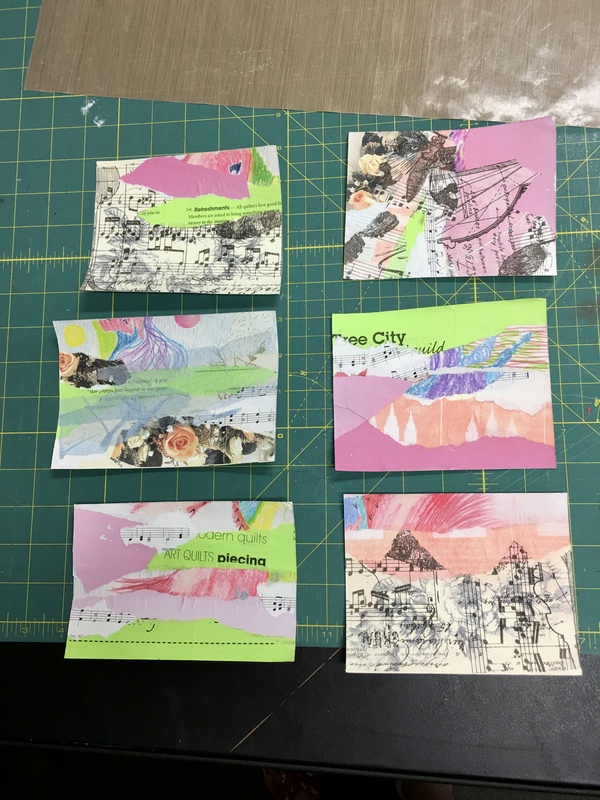 That’s where I learned that Mixed Media (including art journaling, paper crafts, card making, and scrapbooking) is such a big thing. 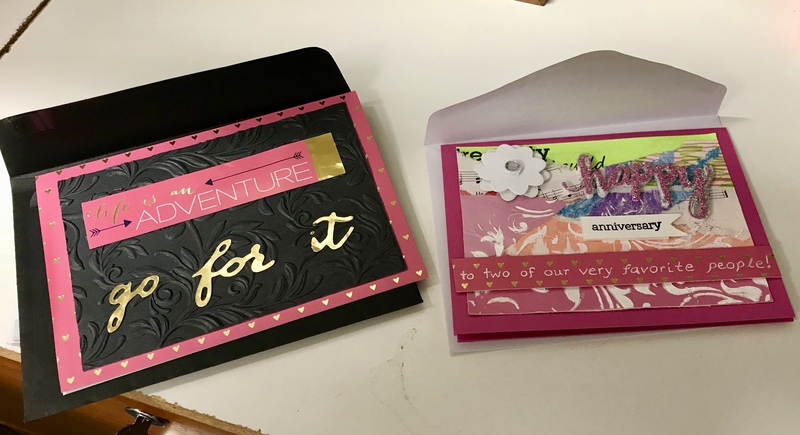 I can see card making: you pay about $5 per greeting card at the store, so you might be able to save money making your own cards. 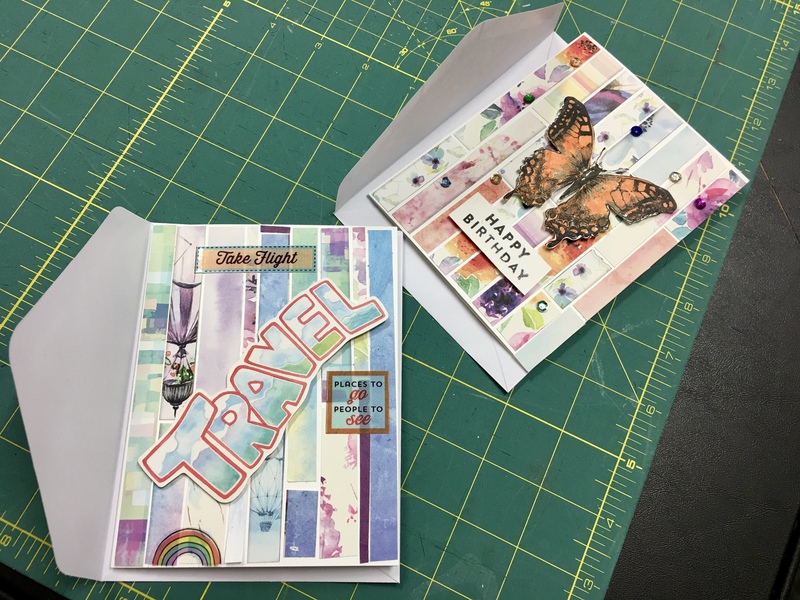 And scrapbooking: you can make some really cute memory books for the family to delight in. But art journaling? It seemed to me to be a vast, deep rat-hole to throw your money down, a waste of time and resources that would only ever benefit your own selfish self. 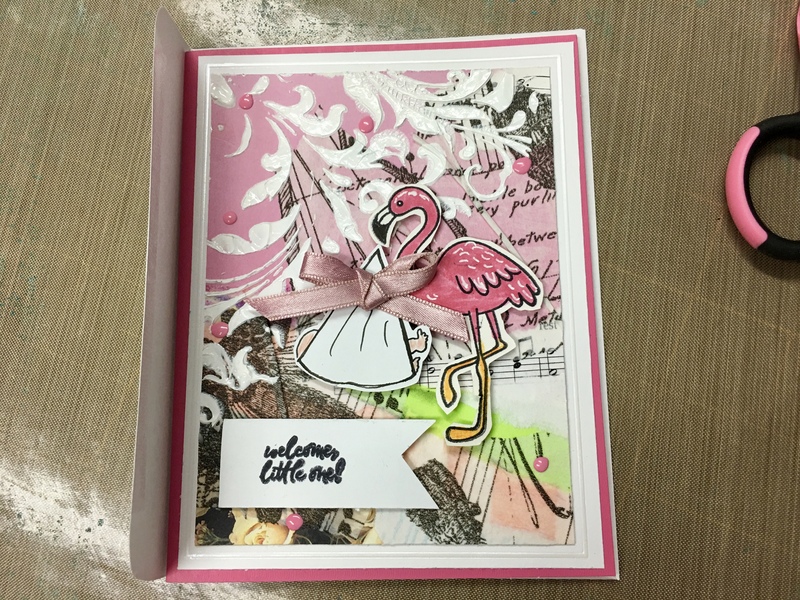 But crafters are jumping on the mixed media arts band wagon. And mixed media art supplies aren’t cheap! 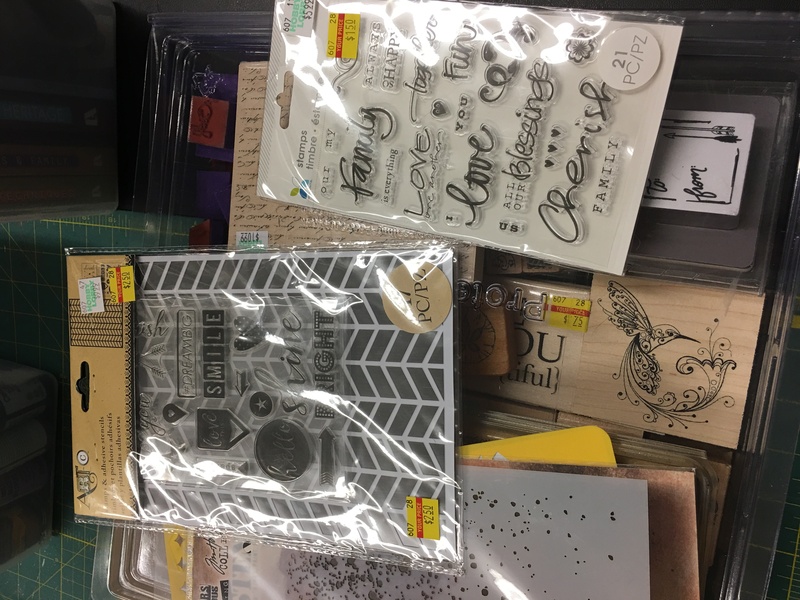 Craft stores sell special designer paints and inks, pricey pens and markers, row after row of stick-on and stamp-on words and motifs in cellophane envelopes. 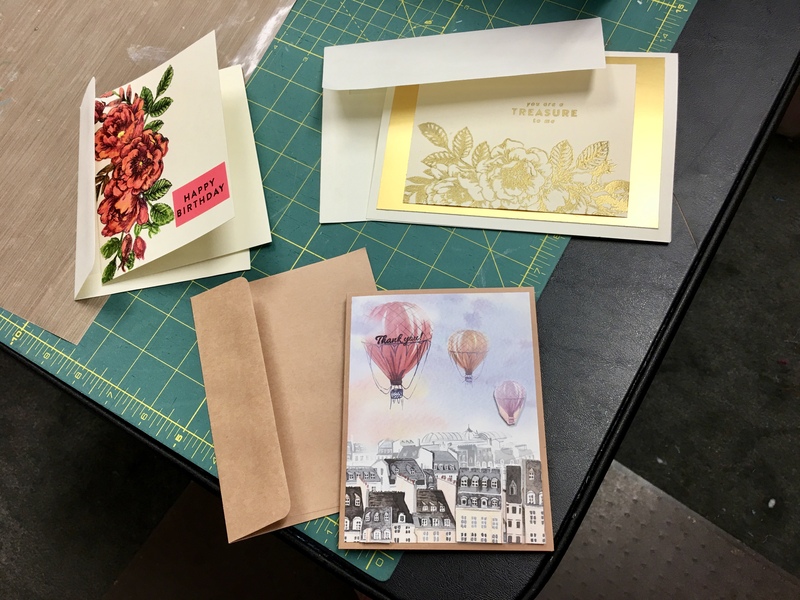 One artist called them “sentiments.” Also essential to the craft is paper: you can buy pricey blank books, but some of the class instructors advocate using an old book as a (non-) blank canvas for your work, and even junk mail and newspaper advertisement pages can be covered in gesso and used as the basis for mixed-media works of art.